Jim Dale has had quite the career. One look at his Wikipedia page is enough evidence for that. Yes I did have to check – his name is certainly more familiar to people of a certain age, who will remember him from his pop days, his theatre work, and his roles in numerous Carry On films. 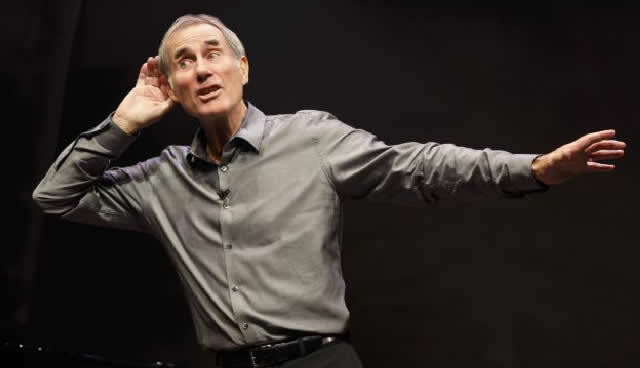 And it’s those people who make up the majority of the audience of Just Jim Dale, a one-man biographical show in which Dale looks back on his career highlights. The opening musical number summarises his life, before he moves on to a series of songs, dances, jokes and monologues that reflect such an incredibly varied career. We hear stories of his music hall beginnings; his inspiring first trip to the theatre; his pop career under the wing of Beatles producer George Martin; his songwriting, including the theme tune to “Georgy Girl”. As the night progresses, there are anecdotes from his time on the Carry On films and his performances on Broadway (most notably in Barnum for which he won a Tony Award), as well as his more recent work narrating the Harry Potter novels for the American audio books (finally, a modern reference!) For many this is a huge nostalgia trip, singing along to his famous tunes and reminiscing on the past. But what is there for younger audience members, besides a history lesson? Dale gives wonderful insight into the life of a popstar, a film star and a theatre star – he really is a triple threat performer. On a technical level alone, Dale is a joy to watch: his singing voice is a smooth, light baritone; his monologues are full of wit; his jokes are surprisingly dirty; and he’s certainly light on his feet. Above all he has excellent…timing. For a man with countless awards, hit singles on the Hit Parade, and a MBE from the Queen, many a young performer could learn from his experiences. Moreover, Dale is a warm and inviting on-stage presence and it is a pleasure to witness such a natural performer. His story is that of a man in constant pursuit of laughter, escaping his working class origins into a world of show business, and he’s not afraid of self-deprecation or slapstick along the way to have the audience hooting. This may not be the fully-fledged drama of most West End shows, but for an evening of light entertainment you couldn’t be in safer hands. 28 May 2015 - A pleasure to witness.